With CSS3: Visual QuickStart Guide, readers can start with a tour of the stylesheet language, or skip ahead to any chapter of the book to look up specific tasks covering just what they need to know. This task-based, visual reference guide uses step-by-step instructions, and plenty of screenshots to... read more teach beginning and intermediate users CSS. Best-selling author Jason Cranford Teague takes readers through today's CSS essentials and provides extensive coverage of CSS3 and CSS 2.1 techniques. 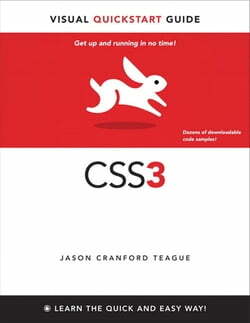 The book outlines what can be done with CSS3 now and how the latest browsers have implemented many of the new features. Both beginning users, who want a thorough introduction to CSS, and more advanced users, who are looking for a convenient reference, will find what they need here in straightforward language and through readily accessible examples.